Many thanks to all who have helped us cope with the demands of the last few weeks. I’m especially grateful for the men who stood in to take meetings while I was on ‘paternity leave’. But so many folk have shown us kindness in other ways. Thank you to those who offered to look after Jesse and John at different times, those who brought round meals for us, those who phoned, visited, e-mailed us. And thank you for all the cards, flowers, gifts that you’ve showered on the family, and especially Victoria Anne. It seems strange to think that only five years ago I was living a bachelor existence. Today, I’m a husband and a father of three, the oldest just over three years old, the youngest just a month old. In many ways life is more complicated now than it was when I was a single man. I’ve less freedom to do my own thing. I have to plan ahead much more carefully. My routines have to fit in with the routines of four other people. One of the most important routines we share is ‘Family Time’. Twice a day, after breakfast and after tea, we sit down to read, pray and sing together. Anne will usually have Vicky on her lap and one of the boys sitting next to her. I’ll be looking after the other. We begin by singing. In the morning, it’s always a hymn from Grace Hymns. We have about fifteen different hymns that we sing again and again – the hymns that we most want our children to learn and remember. God moves in a mysterious way… All things bright and beautiful… Come let us join our cheerful songs… My God how wonderful thou art… There are some which we sing at fixed points during the week. Every Monday morning begins with Awake my soul and with the sun… And we have one which we sing on special occasions – birthdays, anniversaries – Sovereign Ruler of the skies. I won’t claim that John or Vicky join in the hymn-singing. Jesse does – with a bit of encouragement. We look for ways to get him singing with us. Sometimes we’ll take a hymn which repeats the same word or phrase over and over. For example, The Lord is King has the word ‘king’ in each of its verses. So, I’ll encourage Jesse to listen out for the word. I’ll tell him that each time the word comes, I’m going to lift up my arm – and that he must sing out the word with us. And usually he does, enthusiastically. Deaf men Jesus made to hear, lame ones made to walk. They must do the same. Jesse sings the choruses much more readily than the morning hymns. He has his favourites: The wise man built his house upon the rock…. Build on the rock… I’m feeding on the living bread… Now Zacchaeus was a very little man. He knows them pretty well by heart and sometimes we’ll hear him singing them round the house when family time is over. In the morning, after we’ve sung, I read from the ‘One Year Bible’. This is a very convenient way of planning Bible reading. The OYB divides the Scriptures into 365 daily readings. On January 1st you’re given Genesis 1, Matthew 1, Psalm 1 and the first few verses of Proverbs. And so on through the year until you reach Malachi 4, Revelation 22, Psalm 150 and Proverbs 31 on December 31st. The goal is obviously to get through the Bible in a year. We’re not that ambitious. Two years ago we just took the Old Testament passages. Last year we went through Psalms and Proverbs. This year we’ve been reading the New Testament together. How much do the boys understand of what we’re reading? Very little, I suspect. Maybe Jesse will manage to follow some of the stories. I’m sometimes surprised when he reminds me of some detail from a story we read a few days earlier. But I’m sure the doctrinal passages go straight over his head. That doesn’t bother us. Bit by bit we’re familiarising our children with the Bible. If we read through it like this year after year, they’ll understand more each time. And if they learn nothing else at this stage, they’re learning how important we consider the Bible to be. We usually call it ‘God’s Book’ rather than ‘The Bible’, and the children know that no day is complete without our reading God’s Book. The care with which we handle the book; the fact that we insist that they sit still while we read – even these things must surely communicate something of the holiness of Scripture. In the evening, rather than read a second passage, we just pick out one little bit from the passage we read in the morning and talk to the children about it. It may be only a sentence or even a word, but we try to explain it in the simplest words we can. Yesterday’s reading was John chapter 17 so after tea we just took the first verse, ‘Jesus lifted up his eyes to heaven..’ and tried to explain that God lives in heaven ‘above the bright blue sky’ – and yet he listens to all the prayers we pray down here on earth. In the last few weeks we’ve introduced a new element into our family time. Jesse joined the Sunday school at Easter. Every week he comes home with a memory verse. So now we often spend a minute or two in family time going over his memory verse with him. Again we’re conscious that he doesn’t understand most of the verses he learns. But it doesn’t matter. They’re being stored up in his heart and mind. Who knows? God may bring them back to him years later and use them for his salvation. Our family time usually lasts no more than ten minutes or so. We think that anything more would be unrealistic given the ages and personalities of our kids. Sometimes Jesse and John manage to sit through it all, without wriggling, without demanding to go to the toilet, without being silly. And sometimes they don’t. Sometimes our family time ends in tears if one of the boys is determined to misbehave. And now of course there’s a new factor: it’s not easy to hold family worship when you’ve got a four week old baby screaming her head off. I’m not offering our family as a picture of ‘how to do family worship’. We’re still feeling our way, learning as we go along. Some things we set out to do we’ve abandoned, finding that they were just too much of a struggle in our situation. We look at other families and they seem to manage to do so many things that are beyond us. 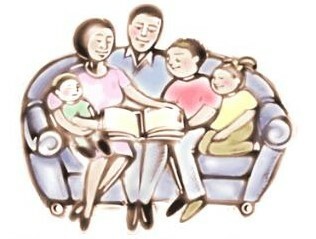 Some parents catechise their children as part of family worship, some read through some helpful book, some encourage each child to pray on each occasion. We don’t do any of those things. And on the other side, there are some things we do that wouldn’t work for another family. Maybe you’ve got children who stubbornly refuse even to try to sing. Maybe you’ve decided that you’ll read from a ‘Story-Bible’ rather than reading through the Scriptures in their entirety. There’s no set formula for family worship. Every family is different. Sometimes, Anne and I look at each other and wonder if we’re achieving anything in our ‘family times’. Perhaps we’ve just had a particularly bad session. The baby’s been crying, Jesse’s been pulling silly faces, John’s been struggling to escape from my grip, and meanwhile I’ve been completely stuck trying to find words simple enough to explain the passage we’ve read. At those times we simply have to tell one another, ‘It’s better to do something than nothing’. What matters is that we’re seeking to honour God and to build a home where he is worshipped. And we claim God’s promise that ‘them that honour me I will honour’ (1 Samuel 2:30). ‘He established a testimony in Jacob, and appointed a law in Israel, which he commanded our fathers to teach to their children; that the next generation might know them, the children yet unborn, and arise and tell them to their children, so that they should set their hope in God, and not forget the works of God, but keep his commandments…’ (Psalm 78 v5-7).